We are proud to showcase the five exceptional winners of our eleventh annual Facilities of the Year Competition, which represent a variety of backgrounds and geographical areas. The dedicated personnel of these facilities have demonstrated they had the patience to figure out ways to improve their environmental performance and the savvy to implement such changes effectively. These top facilities have been singled out for outstanding achievements by governmental regulators, trade associations, and other professional groups. Operated by Montenay York, the waste-to-energy (WTE) facility has processed over 6 million tons of municipal solid waste and has generated over 3 million megawatt hours of electricity since 1989. Serving more than 400,000 residents of York County, the Center is keeping pace with the county's annual trash growth rate of 3.7 percent by successfully handling the growing load. Montenay York constructed an ash recycling center at the facility in 1998 to separate metal and recycled ash and has processed over 1 million tons of ash, recovered over 116,000 tons of metals, and converted over 775,000 tons of ash to Aggite for use as asphalt base, fill material, or landfill cover. Even $10,000 in coins is extracted each month. Unburned residue is returned to the WTE plant for reprocessing to maximize recovery. The center also helps promote proactive programs, such as recycling collections for electronics, mercury, household hazardous waste, batteries, phone books, and yard wastes. Such efforts have resulted in York County ranking among the high percentiles of recycling in Pennsylvania. Montenay York was selected as an Occupational & Health Administration Voluntary Protection Program (VPP) Star Worksite in 2001, was certified as an ISO-14001 facility in 2003 and then chose to become a member of the U.S. Environmental Protection Agency's (EPA) Performance Track Association in 2005. Ranked as one of North America's largest beef processors, Cargill wanted to address toxic air pollutants and odor issues associated with the two anaerobic wastewater treatment lagoons located at its Friona processing facility. It decided to partner with EA Engineering, Science and Technology Inc. in order to turn methane emissions generated from its facility's beef processing into a business asset. EA designed and installed an automated biogas recovery system to recover methane from the lagoons. The system, which was approved by the Texas Commission of Environmental Quality, successfully alleviates toxic and greenhouse gas emissions and controls odors while producing approximately 20 to 30 percent of the fuel used by the facility's boilers. Operating on a continuous basis, the system recovers, on average, 800 cubic feet of biogas (methane and hydrogen sulfide) per day with a monthly gas value of approximately $110,000 (at $6.50 per thousand cubic feet). The Cargill/EA team is currently preparing an application for Voluntary Reporting of Greenhouse Gases for the U.S. Department of Energy (Form E1A-1605), which will prove valuable if the United States develops a national or international greenhouse gas credit trading policy. The facility's system has received several awards for its innovative design: 2005 Design-Build Institute of American Ward of Excellence, 2005 Texas Environmental Excellence Award, and 2004 America Academy of Environmental Engineering Award of Honor. Since 1971, 3M's facility in Brookings has manufactured medical drapes, tapes, and masks. In 2005, which turned out to be a landmark year, the facility had several major accomplishments. The Brookings facility joined EPA's Performance Track program, and committed to the agency to reduce its volatile organic compound emissions, non-transportation energy use, water use, and non-hazardous waste. Likewise, that same year, the facility was accepted by the U.S. Occupational Safety & Health Administration's (OSHA) Voluntary Protection Program (VPP) as a STAR facility. OSHA recognized the facility as having a "tremendous occupational medicine and wellness program," exceptional machine guarding, high quality safety databases, and a knowledgeable safety staff. During the same year, it also completed 40 Pollution Prevention Pays (3P) projects -- a record for the facility. Together these projects prevented approximately 1,500 tons of pollution and 28,000 metric tons of carbon dioxide-equivalent greenhouse gas emissions. All together, these 3P projects saved 3M more than $3,800,000. In 2005, the 3M's upper management awarded the facility two prestigious internal awards: the Chairman's EHS Award reducing its solid waste by nearly 30 percent and the 3M Platinum Energy Award for cutting its energy use by approximately 50 percent. Additionally, the Brookings facility is working toward certification of its site by the Wildlife Habitat Council. As part of its effort, in 2005 it improved its site by adding 30 blue bird houses and a bat box, and by preparing and seeding 13 acres to construct a prairie. The Roche Palo Alto facility is one of five global research centers that are focused on clinical development of new medicines to treat diseases. Eco-efficiency and pollution prevention are high priorities for Roche. In 1995, the facility launched an energy reduction program. During the past four years alone, the program has helped the facility reduce electricity consumption by 35 percent, natural gas consumption by more than 30 percent, and water use by more than 25 percent. Additionally, the facility is in the process of transitioning about 70 percent of the lawns to drought-tolerant landscaping and already seeing water savings of more than 50 percent. The Roche center's waste management efforts include innovative recycling programs for a wide variety of materials, such as plastic bags, electronic devices, landscape debris, Styrofoam, cardboard, magazines and mixed paper. In 2004, the facility sent a substantial portion (145 metric tons) of its solid waste to recycling centers rather than the local landfill. Employees at the facility volunteer their time during business hours to one of several local environmental cleanup or restoration projects. The company provides further incentives by donating $50 for each employee who volunteers to a related non-profit organization. During the past six years, the Roche facility has received a number of awards, including the 2002 San Francisco Bay Business Network Environmental Award in the category of pollution prevention and resource conservation, and the 2006 Pacific Industrial & Business Association's Organizational Leadership Award for building a more sustainable Bay Area. The global automotive manufacturer DaimlerChrysler has a large manufacturing plant in Toluca, which is the capital of the State of Mexico and is located about 40 miles west of Mexico City. In 1998, the Toluca facility built a new centralized wastewater treatment plant (WWTP) to replace eight smaller, separate treatment facilities located throughout the complex. The WWTP currently treats sanitary and manufacturing process water from the facility's stamping and assembly plants, centralizes the facility's used water, and addresses local water shortages and strict environmental discharge standards. Since installing the wastewater recovery system that uses a zero liquid-discharge process, the Toluca facility has reduced water well consumption by 50 percent, which is extending the life of the local aquifer. In addition, the facility saves approximately U.S. $1 million annually. With its new ZLD system, the Toluca plant is capable of treating more than 550,000 gallons per day (gpd); currently, however, it only uses about 250,000 gpd of water in its processing operations. Of that, it recovers more than 95 percent, which greatly reduces the amount of water it must withdraw from the receding local aquifer. 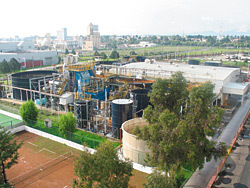 The facility has received a number of awards: the 2002 DaimlerChrysler Recognition award, the 2003 Society of Automotive Engineers International Environmental Excellence Award, the 2004 State of Mexico Environmental Award, and the 2005 Municipal Environmental Award from the Toluca City Government. CertainTeed Corporation Chowchilla, Calif., which specializes in the manufacture of fiber glass insulation, has achieved virtually zero discharge of its manufacturing scrap into California landfills. The facility collects and recycles large amounts of waste, including electrostatic precipitator dust, extraneous glass matter called "slag," cardboard and unused facing, plastic packaging, wooden pallets, and uncured insulation. Questar Pipeline Company, Salt Lake City, Utah, has been an EPA Natural Gas Star Program partner since 2000. Participation in the program prompted the facility to voluntarily minimize fugitive emissions, leading to an annual gas savings of 10.5 million cubic feet. In 2004, Questar improved its air compliance program by adopting an environmental management information system. PPG Industries Inc., Troy, Mich., was presented with the 2005 Environmental Achievement Award by the Environmental Management Association for developing a new product known as a "paint detackifier," which is used in wet paint spray booths in the automotive and industrial sectors. The product's unique main ingredient, chitosan, is derived from crab, lobster, and shrimp shells that otherwise would be treated as a waste product. The Princeton Plasma Physics Laboratory (PPPL), Princeton, N.J., which is the U.S. Department of Energy's collaborative national center for plasma and fusion science, received the 2006 DOE Noteworthy Practice Award for its extensive use of bio-based products. PPPL recently joined the U.S. Green Building Council and has begun to transform its buildings in accordance with the Leadership in Energy and Environmental Design (LEED) standards. San Diego Gas & Electric's Palomar Energy Center, San Diego, Calif., is a new state-of-the-art power plant that produces 45 percent more electricity than older facilities that use the same amount of natural gas. The plant is operated on 100 percent recycled water, including cooling and process water, irrigation, and fire protection. The facility also has the lowest carbon monoxide emissions among power plants in Southern California. Strattec Security Corp., Glendale, Wis., manufactures more than 50 million locks and keys per year for the North American transportation industry. Since 2000, the facility has successfully eliminated the use of several hazardous materials, including hexavalent decorative chromium plating, caustic, and toxic zinc cyanide plating bath. As well, in 2005 the facility saved 6 million gallons of water through increased efficiency. Tyson Fresh Meats Inc., Dakota City, Neb., specializes in meat packing and rendering and also operates a blue chrome tannery. In 2005, the facility implemented an environmental management system to ensure regulatory compliance. Additionally, the plant has begun using scrubbed biogas from its covered anaerobic lagoon and beef tallow as fuel sources for its boilers.